The flow of carbon and nutrients from plant production into detrital food webs is mediated by microbial enzymes released into the environment (ecoenzymes). Ecoenzymatic activities are linked to both microbial metabolism and environmental resource availability. 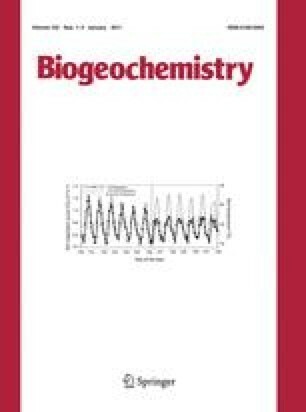 In this paper, we extend the theoretical and empirical framework for ecoenzymatic stoichiometry from nutrient availability to carbon composition by relating ratios of β-1,4-glucosidase (BG), acid (alkaline) phosphatase (AP), β-N-acetylglucosaminidase (NAG), leucine aminopeptidase (LAP) and phenol oxidase (POX) activities in soils to measures of organic matter recalcitrance, using data from 28 ecosystems. BG and POX activities are uncorrelated even though both are required for lignocellulose degradation. However, the ratio of BG:POX activity is negatively correlated with the relative abundance of recalcitrant carbon. Unlike BG, POX activity is positively correlated with (NAG + LAP) and AP activities. We propose that the effect of organic matter recalcitrance on microbial C:N and C:P threshold element ratios (TER) can be represented by normalizing BG, AP and (NAG + LAP) activities to POX activity. The scaling relationships among these ratios indicate that the increasing recalcitrance of decomposing organic matter effectively reverses the growth rate hypothesis of stoichiometric theory by decreasing carbon and nutrient availability and slowing growth, which increases TERN:P. This effect is consistent with the narrow difference between the mean elemental C:N ratios of soil organic matter and microbial biomass and with the inhibitory effect of N enrichment on rates of decomposition and microbial metabolism for recalcitrant organic matter. From these findings, we propose a conceptual framework for bottom-up decomposition models that integrate the stoichiometry of ecoenzymatic activities into general theories of ecology. J.J.F.S. was supported by the National Science Foundation (DBI-0630558). R.L.S. was supported by NSF EaGER (DEB-0946288) and Ecosystem Studies programs (DEB-0918718). Source data were contributed by Sinsabaugh RL, Lauber CL, Weintraub MN, Ahmed B, Allison SD, Crenshaw C, Contosta AR, Cusack D, Frey S, Gallo ME, Gartner TB, Hobbie SE, Holland K, Keeler BL, Powers JS, Stursova M, Takacs-Vesbach C, Waldrop M, Wallenstein M, Zak DR, Zeglin LH.